Solidarity Shabbat | Congregation Anshi S'fard: Judaism. Community. Morningside. Congregation Anshi S'fard: Judaism. Community. Morningside. Join us for a Saturday morning program to show that love is stronger than hate. The program will include a discussion about hate and anti-Semitism, an open Ask the Rabbi session on anything you ever wanted to know about Judaism, kaddish prayer on behalf of the Pittsburgh victims, and will end with ‘kiddush’ refreshments – authentic Jewish foods. There will be a coinciding yoga program for children 3-8. 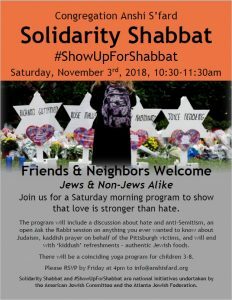 Solidarity Shabbat and #ShowUpForShabbat are national initiatives undertaken by the American Jewish Committee and the Atlanta Jewish Federation.